If you're holidaying in Las Vegas, fancy a steak and want to be reminded of the Tube (don't we all) pop into Gordon Ramsay's new steak house. 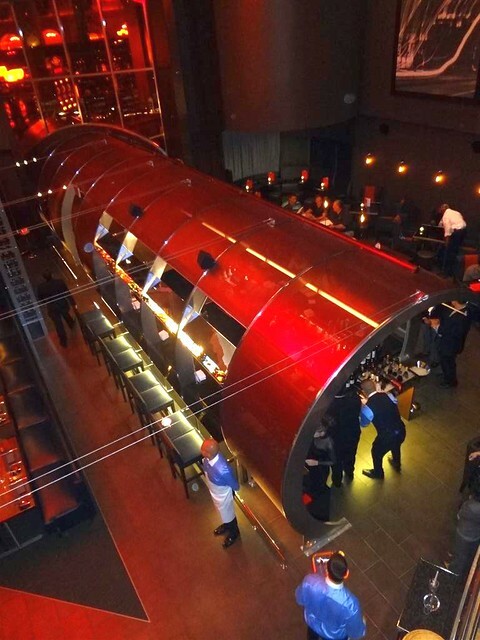 Celebrity chef Gordon Ramsay has opened up a new restaurant with a London Underground shaped bar at its centre in a casino hotel in Las Vegas. It's his first establishment in the US gambling hub. Ramsay, who holds a number of Michelin stars already has restaurants in New York and Los Angeles, and now has "brought his unique style and culinary flair to Las Vegas with the opening of Gordon Ramsay Steak at Paris Las Vegas," said a statement issued on Friday. The Las Vegas venue is described as a modern steakhouse serving huge cuts of beef and lamb, but "British Ale Onion Soup", Shepherd's Pie, Scotch Eggs, Fish and Chips and Sticky Toffee Pudding will also be on the menu to satisfy those on a break from gambling with some good old British stodge. John Curtas from the food blog "Eating Las Vegas" said "The Tube-like entrance (and the bar inside it) symbolizes the London Underground, and immediately makes an architectural statement about the big, brash Brit whose aura alone is enough to ensure the success of the place." It's certainly an architectural statement. However if he wanted to complete the ambience of late night eating and drinking in a Tube carriage, I'd suggest he throws in a few accordian playing buskers, a rambling nutter in the corner, some drunken office City boys & sprays around some Eau de KFC or Fragrance of Chicken Cottage for good measure. Hat tip @TheSkintFoodie who originally tweeted about this over the weekend.